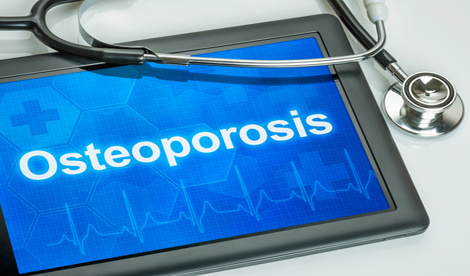 Oral bisphosphonates, such as alendronate, risedronate and etidronate, are the initial therapy advised by NICE for osteoporosis because of their efficacy and cost. They must, however, be taken under a certain set of conditions, which some patients may find difficult to adhere to. Osteoporosis is a condition that is characterised by increased bone fragility, often resulting in fractures, and in turn, pain and disability.1 There are a number of options available for the prevention and treatment of osteoporosis, but their success is often limited by compliance, with many preventative measures requiring regular therapy. 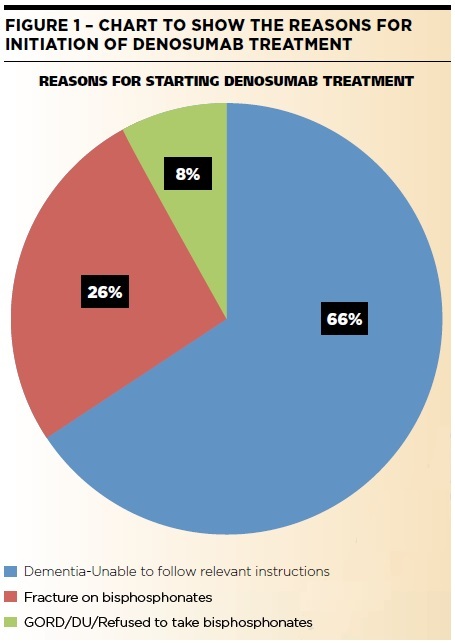 These include supplements such as bisphosphonates that require weekly or even daily administration by the user, with documented adherence rates of less than 25% over the course of a year.2 It is therefore important to explore other options that are available that would enable higher adherence. Oral bisphosphonates, such as the aforementioned alendronate, risedronate and etidronate are the initial therapy advised by NICE because of their efficacy and, importantly, cost. Alendronate costs just £53.56 per year (15 pence a day)7 and has the benefit of availability of long-term safety data. Such a combination of low price and long-term data justifies its place at the forefront of osteoporotic fracture prevention. However, there remains one drawback; oral bisphosphonates must be taken under a certain set of conditions, which some patients may find difficult to adhere to. These include having an empty stomach prior to administration, and after taking the medication, sitting upright for up to an hour, taking no other medications for 30 minutes, and not lying down until having eaten.8 Each of these steps poses its own problem for the user, and with the target demographic often over 75, these problems are further exaggerated. Mr X is a 100-year-old man who presented with a fractured neck of femur. The patient had advanced dementia with an abbreviated mental test score (AMTS) score of 0/10 and was unable to self-administer bisphosphonate medication correctly. The patient’s renal function, calcium and vitamin D levels were checked and were within in the normal range. The patient was therefore a candidate to be started on denosumab therapy and was administered the S/C injection and suffered no immediate side effects as a result of his therapy. The patient will need to have follow up treatment every six months and continue to take calcium supplementation every day. Ms Y is an 84-year-old woman who was started on bisphosphonate therapy six years ago after a previous neck of femur fracture, along with calcium supplementation. Despite this treatment the patient suffered a fracture to the other neck of femur. The patient’s renal function, calcium and vitamin D levels were checked, which were within in the normal range. This patient was subsequently started on denosumab therapy and they did not suffer any adverse effects as a result of the therapy. The patient will need to have follow up treatment every six months and continue to take calcium supplementation every day. The above case studies highlight key scenarios for when denosumab can be the primary solution. This drug, if administered correctly, is shown to be associated with a reduction in the risk of vertebral, non-vertebral and hip fractures in women with osteoporosis.12 Despite this, there are issues that need to be overcome, specifically the identification of side effects. Documented adverse effects associated with the use of denosumab include diarrhoea, infections (chest, ear, skin and urine), cataracts, osteonecrosis of the jaw and hypocalcaemia.5 Thus it is essential to monitor patients who have been started on this relatively novel medication, to ensure any side effects are noted and managed. In the long-term, this may help to improve uptake of denosumab, and allow for its more widespread implementation across the healthcare system, providing enough short and long-term data is collected. One such side effect that can easily be managed is hypocalcaemia, by checking the calcium and vitamin D levels of the patient and correcting them prior to administering denosumab. Identify all of the patients who have been commenced on denosumab following a fractured neck of femur, including demographic details of each patient. Document reasons for starting denosumab. Identify and document any in hospital adverse reactions after commencing denosumab. Denosumab was prescribed in 39 patients with fractured neck of femur who were unable to take, intolerant of, or had contraindications to bisphosphonate, or who sustained a fracture whilst on bisphosphonate therapy. Data was collected by noting the patient details of those commenced on denosumab with fractured neck of femur whilst the audit was on going, as well as contacting the pharmacy department and asking for the details of all patients prescribed denosumab over the previous 24 months from January 2013 to Dec 2014. The hospital computer system was then used to collect the necessary data. The discharge summaries and TTO’s of the patients commenced on denosumab were also analysed to ensure there was complete documentation of the initiation of the therapy. The data gathered revealed that 94% of the patients who were commenced on denosumab were above the age of 75 years and predominantly (85%) were females. Some 66% (25 out of 39) patients were started on denosumab because they had dementia and could not follow relevant instructions, 26% (10 out of 39) patients suffered a fracture whilst on bisphosphonate and 8% (4 out of 39) patients were started on denosumab because they had gastro-oesophageal reflux disease or refused to take bisphosphonates due to any reason (figure 1). Most importantly, side effects were not reported in any patient during hospital stay. In this audit no patient was intolerant to, or suffered from, allergic or side effects after initiation of denosumab during their inpatient hospital stay. Therefore, it seems that it is safe for primary care physicians to initiate this therapy in primary care to enable higher adherence and improve secondary osteoporosis bone protection. Dementia appeared to be the primary reason for starting denosumab therapy, and may be worth noting for future clinical practice as a first line in those patients. However, it is also essential that the clinical teams responsible for initiating denosumab therapy in the hospital or in the primary care are aware of what needs to be done before and after treatment. For this reason, the medical team member in the hospital responsible for writing the discharge summaries and authorising the TTO’s is now given an information sheet about denosumab and prescribing it, on which the following points listed below are emphasised. GP has been requested to continue denosumab and give future injections at six-monthly intervals, including starting date. We found no patient was intolerant to, or suffered from short-term allergic or side effects after initiation of denosumab during their inpatient hospital stay. Therefore, it seems that it is safe for primary care physicians to initiate this therapy in primary care. Serum calcium and vitamin D levels in the blood should be checked and replaced as required prior to every six monthly denosumab administration. All patients should be co-prescribed calcium supplementation in order to prevent hypocalcaemia during denosumab treatment. Primary care physicians must be aware of denosumab treatment being started, and initial administration date so six monthly injections can be followed up. This may enable higher adherence to bone protection especially in older patients with cognition impairment and inability to understand and retain instructions, in particular, dementia patients. 3. British Medical Journal Best Practice http://bestpractice.bmj.com.libproxy.ucl.ac.uk/best-practice/monograph/85/treatment/details.html#expsec-3 accessed 15th October 2016. 5. NICE TA204 Denosumab for the prevention of osteoporotic fractures in postmenopausal women http://www.nice.org.uk/guidance/TA204 accessed 8th October 2016. 6. NICE TA265 Denosumab for the prevention of skeletal related events in adults with bone metastases from solid tumours http://guidance.nice.org.uk/TA265 accessed 10th October 2016. 11. Medicines and Healthcare products Regulatory Agency Drug Safety Update, Volume 6, Issue 9 April 2013 http://www.mhra.gov.uk/home/groups/dsu/documents/publication/con267913.pdf accessed on 8th February 2014. 13. Denosumab http://www.cancerresearchuk.org/cancer-help/about-cancer/treatment/cancer-drugs/denosumab accessed on 8th February 2014.